In a small non-reactive pan, bring water, vinegar, salt, and sugar to a boil. Remove from heat and allow to cool. Place pepper, allspice, mustard, and celery seeds in the bottom of two clean quart-size ball jars or one great big half liter jar like I did. Pack cucumbers in tightly, the more you pack in, the more you'll have in the end. Drop garlic pieces into the jar around and between cucumbers. Carefully pour your brine over your cucumbers, being sure to cover them completely (you should have approx. 4 cups brine after boiling and cooling and you’ll probably have a little left over), and place dill sprigs on the top of the jar before sealing very well. Turn and shake jar until seeds have distributed throughout the brine. Place in refrigerator for at least 24 hours. Try not to sneak any out of the jar early, but after the 24 hours...yum! Pickles! Take THAT Claussen! Oh I understand the impatience. Did you save me a jar? I just finished making these and put the jars in the fridge- now! Can I wait 24 entire hours before I try one? We'll see! Joy, do you even like pickles? If you want, I'll make you more. I'll be making more for me anyhow. Liska, absolutely! The recipe came out great, thank YOU for sharing it. Marie, they are definitely worth the wait, I promise. I've been stealing spears from the jar all week. Yum! What a cute blog! Followed your link from Giver's Log. (You need photography lessons? Pshaw.) 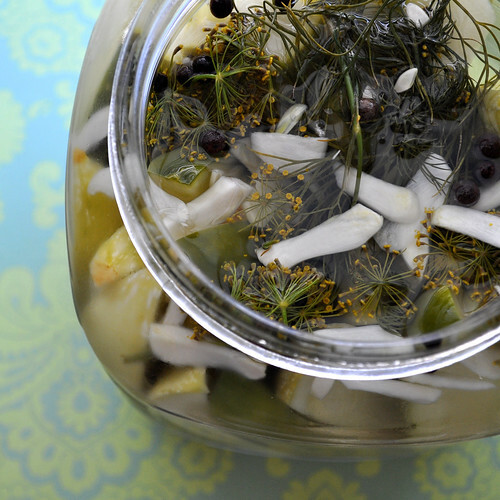 My grandmother always made dill and grapelead pickles - the best. I miss them! my wife loves pickles, what a great way to make your own and use some of this great produce we have!!! Now I just need to buy some jars! thanks so much for sharing!! Home made pickles ... with dill... my favourites! your photos are to die for! Can't wait to try these! I'm sure we will eat them in a hurry, but with so many cucumbers being ready right now, I'd like to make up several batches. Do you know how long they might keep in the frig? That's a good question, but unfortunately they go so fast in my house that I can't really give you a max time. They aren't completely "canned" so I don't think they'll last longer then a month, but I'd say just use your judgement and don't eat them if you see the brine getting cloudy or odd discoloration on the pickles. The garlic might turn colors, but that shouldn't be a problem. Hope that helps. Oh... my... gosh! These turned out soooo well! 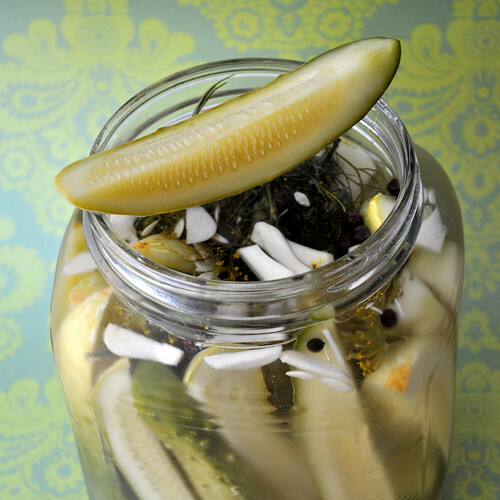 So tasty, and so much better than store-bought pickles! I've never tried making them before, and I've already been through a jar of them! So yummy, I am definitely saving this recipe! Can these be made shelf stable? They are sooooo yummy!